​I've been asked by several people why i quit writing in my Chessy'ville blog Well, I don't know why, I would probably would say, "I don't have enough time!" In reality, I'm just being lazy and not wanting to take the time. After reading my first blog post, "Just want to make sure this thing is working. I've been praying about writing a weekly christian blog but don't want to bore anyone. What do you think? Shall I write or not. I think I know what the Lord has been leading me too." A co-worker asked, is wrong to not do something that the Lord is placing on your heart, are you being disobedient?" Well after I stuttered for a bit I told him that he was correct. I'm ashamed to say that conversation was over a year agoSo, here I am again...hopefully I won't bore you with my ramblings! With a significant day coming soon, I thought maybe it would be fun to do a bible study on 5 - 5's. So I looked up Genesis 5:5. Now I've felt old before and 55 IS looming in the very near future, this verse made me laugh when I read it. 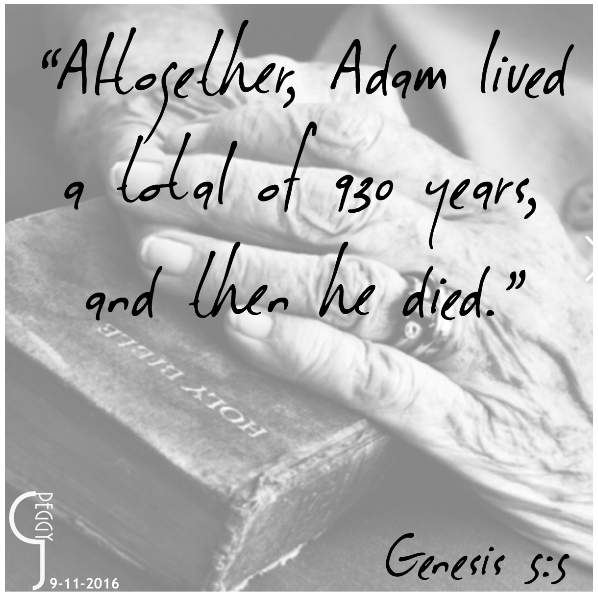 Genesis 5:5 - "Altogether, Adam lived a total of 930 years and then he died"
Then I thought WOW, I only new my grandparents as "being old". I know they were young and grew but sadly they were always old in my eyes. Grandpa Diehm was born in 1890 and died in 1975 at 84. He is the first person I knew that died. When he died he had 9 grand and 3 great grandchildren, now just a mere 41 years later with just my family unit there are 16 great, 16 great great, and 5 great great great grandchildren. I know that with my mother, her grandchildren called her Gramma. When my sister, Pat became a grandmother, they call her Grammy. This was a simple way to tell the difference between the two. 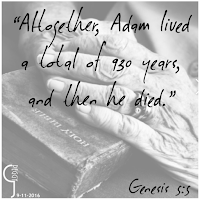 So how many other names did Adam's children, grand, great grand, great great grandchildren...Well you see my point. The history of a family is often very fascinating buy sometimes can be very sad because as time goes by families lose each other. Remember when I mentioned in just my family unit there are 46 children that would have called Paul Diehm, grandpa? I know there are more from my Uncle Harold's side but we are a family that has scattered. So I cannot tell you how many there truly are. As generations come and go, how many (without doing a genealogy study) know the name of their 9 times great grandfather. Do you think Adam's did? Hug your children today, even if it's just a hug in your heart. Thanks Patricia Hoffman for helping me with the grandpa info. Love You, sisser!